It's wonderful to see the #onelesspie effort gathering interest, especially on twitter. For my introductory post yesterday, I wanted to focus on encouraging people to improve pie charts everywhere. 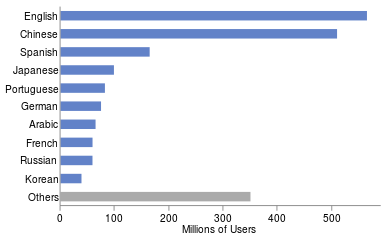 In this post, I want to show you how I remade the pie chart in JMP. The first step is to get the data, and fortunately the data is contained in the wiki page as a table. Plus, there is a link to the source so I could verify that it was the latest and accurate. JMP’s Internet Open menu command is great at reading Wikipedia tables, making the whole data acquisition step quick and painless. 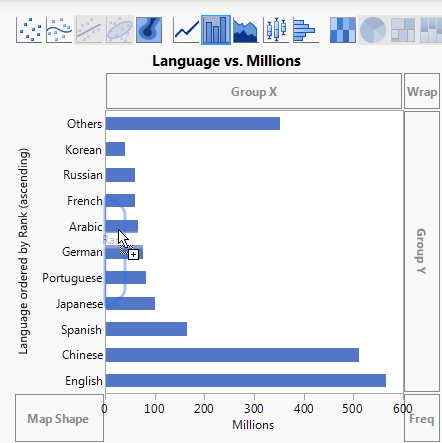 Making a bar chart in Graph Builder was quite straightforward, but there were three tweaks that are not so obvious. Can you spot them? 2) Ordering the bars. For ordering, I used the existing rank column, though it would have been easy enough to add such a column. I dragged it into the Merge/Order hot-spot, which is just inside the axis. It’s highlighted in blue when dragging. After that, I right-clicked to change ascending to descending to get Others at the bottom. 3) Graying the bar for "Others." In Graph Builder, the bar color can be determined by a data column, so I created a new column called "other" with values of "y" for the "Others" row and "n" for the others. Then I used that column in the Color role to get it a separate color for it. I right-clicked on the legend to change red to gray, and I excluded the legend from the final picture (so the actual values didn't matter). After some final adjustments for the axis text and sizing, I saved the image as an SVG file and verified it in a Web browser.